The G-Speed Shuttle with Thunderbolt 3 device delivers high performance storage to save all your favorite 4K or 8K high dynamic range (HDR) and high frame rate (HFR) footage in a single location. With transfer rates up to 1000MB/S, the G-Speed Shuttle with Thunderbolt 3 device delivers the performance you need to quickly ingest content and natively edit footage to make changes in real-time. Created for easy travel between your on-site production location and to the studio for post-production, the G-Speed Shuttle with Thunderbolt 3 device delivers powerful, transportable storage to help improve your workflow efficiency, wherever you are. Made for multi-stream 4K and 8K production workflows, the G-Speed Shuttle with Thunderbolt 3 device offers the bandwidth to support multi camera editing in real time, render footage with multi-layer effects, and quickly export in an efficient workflow. 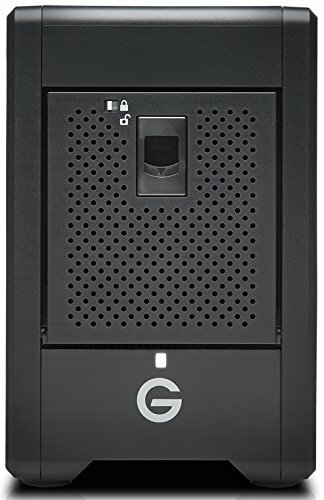 For maximum performance, the G-Speed Shuttle with Thunderbolt 3 device comes in RAID 5 out of the box and supports RAID 0, 1, and 10 to provide a versatile and flexible storage solution. For all your demanding workloads and mission-critical footage, you can depend on the power and enhanced reliability of four removable Enterprise-class 7200RPM hard drives inside. If you have any questions about this product by G-Tech, contact us by completing and submitting the form below. If you are looking for a specif part number, please include it with your message.